So far so good with working out! Today I did 20 minutes jump roping, 15 minutes of Abs and 40 minutes of Body by Jake which was all strength training. I think with that workout I could of used heavier weights. I used 5lbs dumb bells, only because I never did the workout before. It was tough, but not to bad, I didn’t move as quick as he wanted to, but I rather have proper form. I tend to lose my balance easily. Do you ever exercise to Exercise TV on Demand? I love it, it’s like having a huge video library. Well tonights dish, is well, see for yourself. 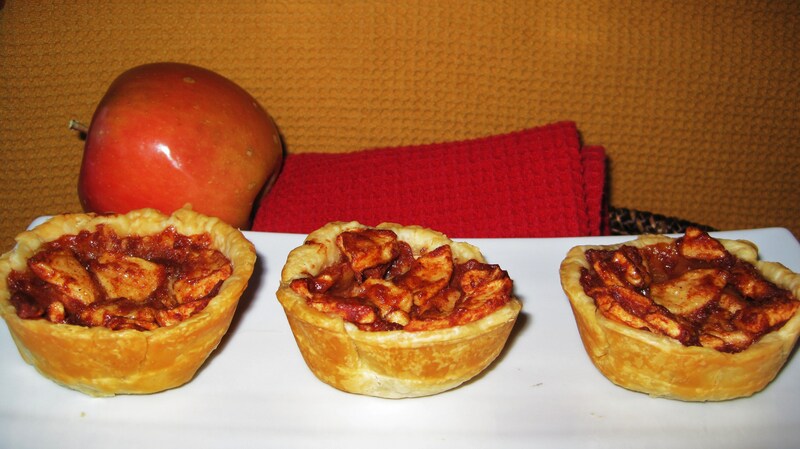 I made individual apple pies. They tasted, juicy, the crust was perfect and I couldn’t be more happier. I didn’t make my own crust, I used Pillsbury Refrigerated Pastry Dough. So much more easier, then making my own. What I did is use one pie crust, and rolled it real thin, my goal was to get 8 cut outs from it, so that would be 100 calories each for the crust. I used a large mouth coffee mug to cut out the circles. Then I would flatten the dough and roll it out again, until I got 8 circles. 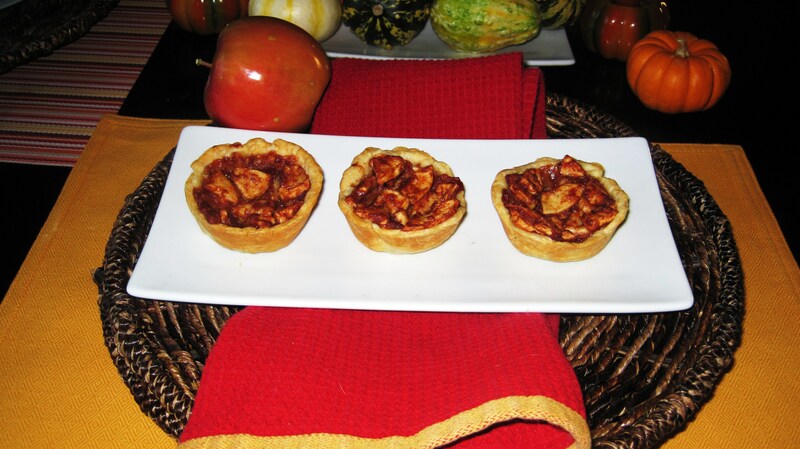 I placed them in a regular muffin pan and topped with my apple filling. Put a 1/4 tsp of butter and a sprinkle of Raw Sugar on top. Place in the oven for 25 minutes, until crust was light brown and the apples were bubbly. I love portion controlled and guilt free desserts! 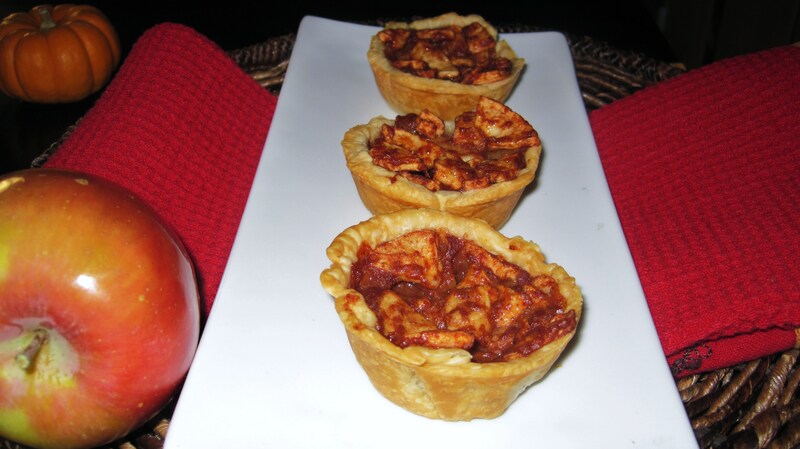 Beats a 300 or more calorie pie and tastes just as satisfying! In a large bowl, add your apples, lemon juice, flour, cinnamon, nutmeg and brown sugar. Mix together till all the apple are coated. On Parchment Paper, roll out 1 pastry dough thin, put the other back in the fridge and save for another use. Use a wide mouth cup or large cookie cutter and cut out 8 circles. You will have to roll out the dough about 4 times to get this. 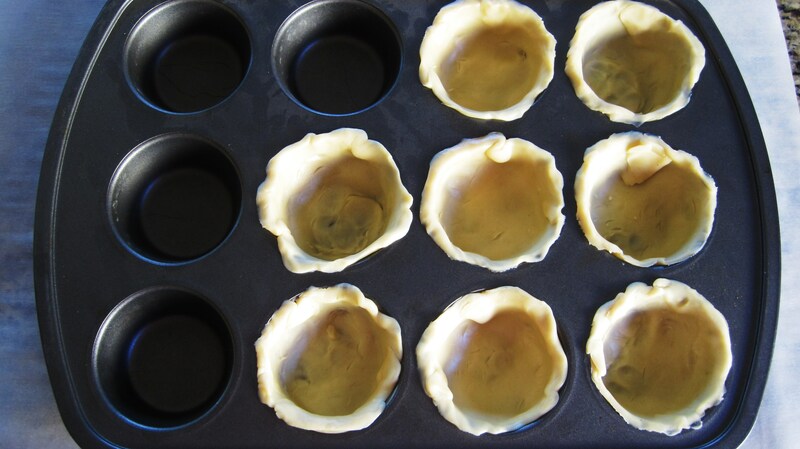 Place the individual dough in a standard muffin pan. If you get tears, just patch up with remaining dough or smooth with finger. The dough is easy to use. Top the dough with apple mixture, add 1/4 tsp. 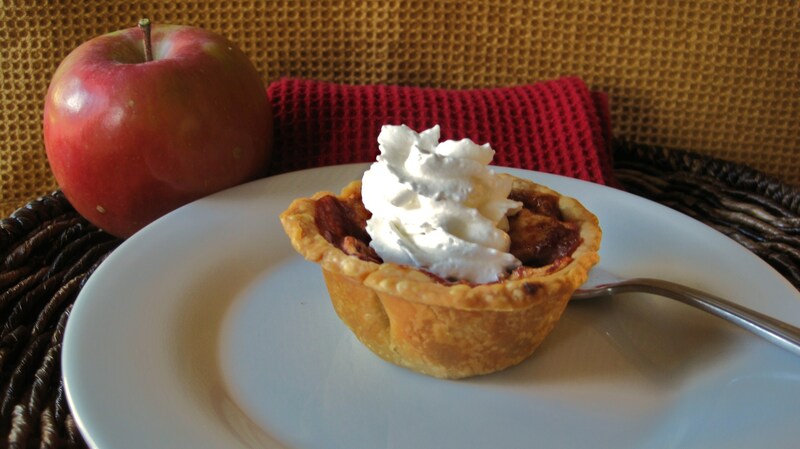 of butter onto each apple tart and sprinkle with Turbinado Sugar. 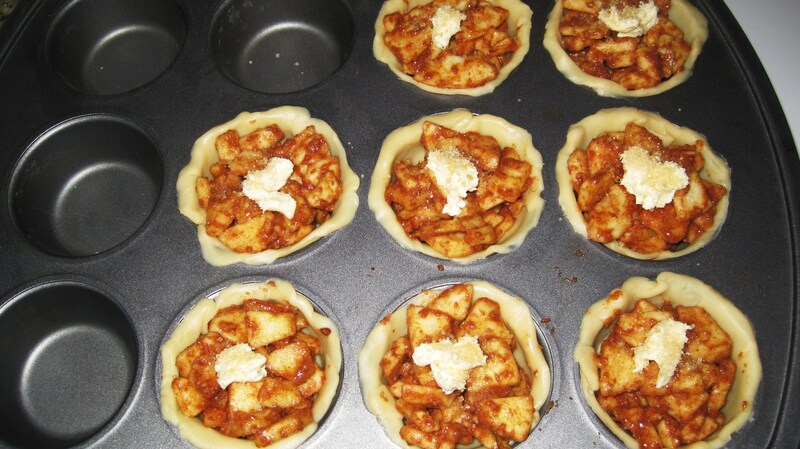 Place in the oven for 25 minutes or until crust is light brown and apples are bubbly. Let the tart cool. 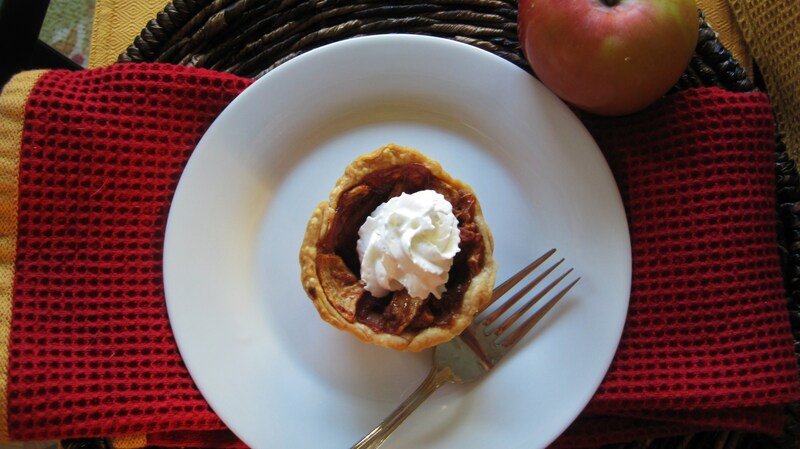 Top the tart with whip cream or ice cream. Serve and Enjoy! They tasted just like Apple Pie! The crust tastes homemade! My family loved them, they were gone by morning! Glad I got two of them!!! This would be great at parties or even for Thanksgiving! I’m off to make Peanut Butter! Have a great day!! 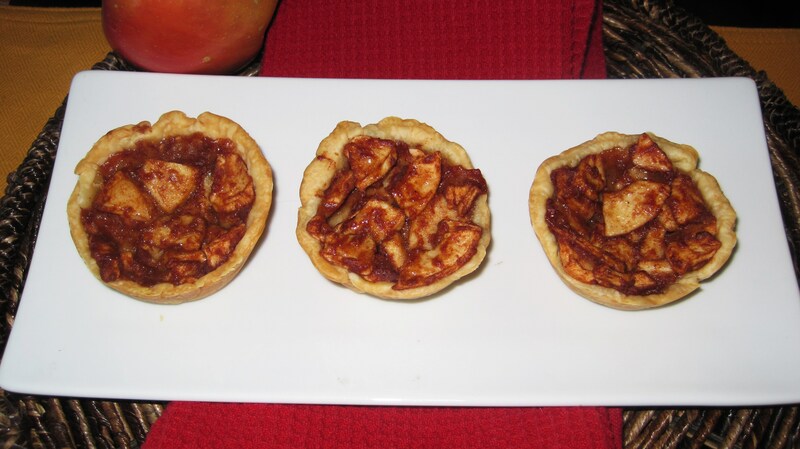 I like these little rustic looking pies! The whole wheat pastry flour in the crust and the nutmeg as well as cinnamon in the pie filling makes for a delicious treat. Also, they have the extra bonus of it being low in fat and calories! Well done! OMG! That sounds so good! Anything with Almond Butter, Peanut Butter and Nut Butter is so delish! What a great idea!!! Love it! !